Toy Story is a real love bug. His dam (Holly) at the age of SEVEN just went GRAND CH and BOB at the Arizona State Fair fall of 2011. Not to be outdone, his litter sister (Showbiz) also went GRAND Junior CH. He is very long and tall. Standing on strong feet and legs we are looking forward to what he can do for our herd in general appearance as well as milk production ! We've retained several of his 2012 daughters. One daughter, Jessie, already has her Junior CH leg. 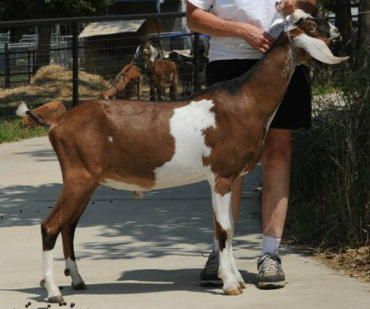 He was on loan to us for 2011-12 from our dear friend Debbie Emholz at Jacob's Pride Nubians. He has returned home to Debbie and we look forward to seeing some great things from him.